I came across this unique wall decal company in my search for something different to spruce up my walls. One look at this design and I had to have it. My walls are so bare and were begging for this. The lovely PR at Design with a Z provided me with this design for review. Just in time for Autumn, the colors of this tree compliment my decor so well. 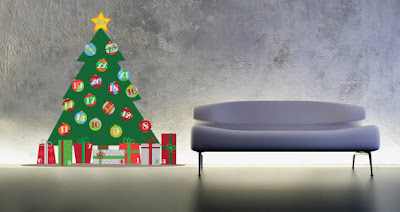 This tree was conveniently customizable, with plenty of colors and sizes to choose from. I went with the pink and orange leaves with a brown trunk, because those colors really appealed to me and seemed to fit my decor the best. In fact, I had two owl figurines sitting around that went perfect with it, but didn't even realize their colors were very close until after it came. I chose my desk & work area to showcase this, because I thought it would be really peaceful to look at while I am working. I was right, it is very nice to gaze upon when writing and sometimes gives me more artistic inspiration. I've had decals before. Ones with text and another design that is over my bed, but never have I had something so sleek, without a trace that it is actually plastic on my wall. When I look at this I literally think of a cartoon tree growing out of my desk. The way the leaves are designed to fall from the tree gives it an alive moving feeling. I couldn't have received a more better suited decal. It is so whimsical and cute. Did I mention that I have tree and forest pics all over my place? Yeah, I have a tree fetish, a regular nymph, without the pointy ears and magical powers. Though, in my mind I like to pretend I do! Another tree I love is this Christmas one. How great is that? If you don't want to go through the hassle and cleanup of a tree this year or just want to do something different, this is such a cute way to do it. Getting this beauty up on the wall was a cinch.There were times where I would pull the paper and the design wouldn't stick to the wall, so i'd have to go back and smooth over that part of the design with the plate they give you, but there was nothing to it. All it takes is a little patience. This decal would be perfect as a gift to yourself, a loved one or a particular person fond of art. I think that a decal like this would be an awesome Holiday gift. 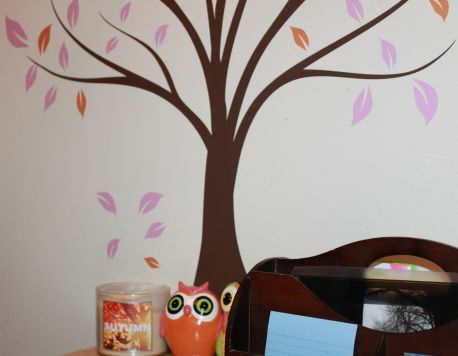 Decorate your babies room or find that new look you've been craving. Just one of their decals will dramatically change a space and give it a whole new look and feel. It definitely did that for me! They have everything for every taste. You can check out more by visiting their store front and Facebook. Love these! I think your desk is the perfect spot! 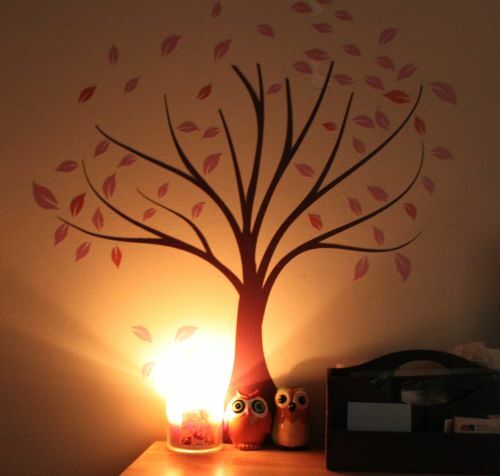 I love the tree wall decal looks so inviting and peaceful!! OMG! I love this! How pretty! I love how it looks when you light the candle.